Bad Medicine is the state’s best known Rainbow Trout lake. Each year hundreds of fishermen make the trek in quest of the rainbow. The clear, cool, well-oxygenated waters make good Trout habitat. 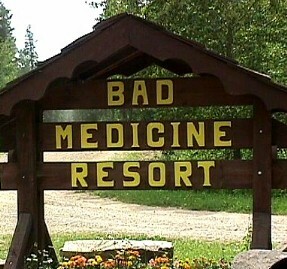 Bad Medicine Resort is located on the East Side of beautiful Bad Medicine Lake. We are 10 miles West of Itasca State Park along State Highway 113. 17 miles North of Park Rapids on Hwy. 71-turn onto Hwy. 113 for 10 miles, and take East Bad Medicine Road for 2 miles. We are nestled among the many Birch and Pine trees. We are just below the South boundary of Itasca State Park. Those of you who would like to attend church services on Sunday morning, we have The Chapel of the Good Creation on our grounds, with services from Memorial Day weekend through Labor Day weekend for all denominations at 11 am. Please join us to rejuvenate the mind with a relaxing, fun service, fellowship and coffee. Campsites are spaced among the pine and birch trees on terraced sites. By beautiful Bad Medicine Lake which is spring fed, with neither an inlet or outlet. We have complete hook-up sites with elec., water, and sewer for RV or motor homes. Sites with water and electricity, and rustic sites for tents with no hook ups. All sites have picnic table, fire ring and a dock for your boat. A modern shower house is included with your campsite. For enquires for seasonal or weekend camping we would be more than happy to visit with you-please call us. Extra person per site $5.00 Daily, Children 11 years and younger $3.00. Daily rates are based on a 24-hour stay. Air Conditioning-$3.00 daily. 6.5% sales tax must be included for all rates. No Credit or Debit cards-we accept cash and checks. One camping family unit per site and one vehicle. Holiday Camp Site weekend-3 nights reservation with a 3 day $75.00 basic price deposit. Campground pets PERMITTED ON LEASH ONLY . Please no Jet Skis or Jet Boats, we would rather listen to the Loons. A million times I’ve cried. Welcome to your online source for Log Cabin Lodge Decor Furnishings! This Site contains trademarks and copyright material furnished by Moose-R-Us.Com/Attic Moose Antiques LLC and its licensors.